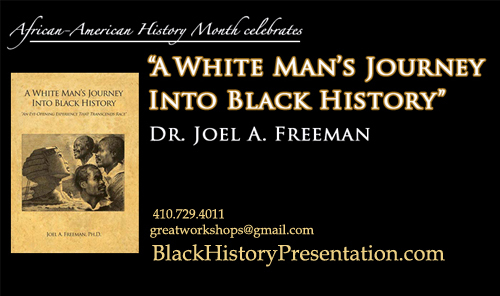 Copyright © 2005 - NOW by Joel A. Freeman, Ph.D. All rights reserved. "...Though its proportions are colossal, the outline is pure and graceful; the expression of the head is mild, gracious, and tranquil; the character is African, but the mouth, and lips of which are thick, has a softness and delicacy of execution truly admirable; it seems real life and flesh. Art must have been at a high pitch when this monument was executed; for, if the head wants what is called style, that is the say, the straight and bold lines which give expression to the figures under which the Greeks have designated their deities, yet sufficient justice has been rendered to the fine simplicity and character of nature which is displayed in this figure..."
In 1787, Count Constantine de Volney -- a French nobleman, philosopher, historian, orientalist, and politician -- embarked on a journey to the East in late 1782 and reached Ottoman Egypt were he spent nearly seven months. Constantine de Volney was troubled much by the institution of slavery. His expressed opinion that the ancient Egyptians were black Africans much departed from the typical European view of the late eighteenth century, but it gave many people cause for reflection. During his visit to Egypt he expressed amazement that the Egyptians – whose civilization was greatly admired in Europe – were not White! "In other words, the ancient Egyptians were true Negroes of the same type as all native-born Africans. That being so, we can see how their blood, mixed for several centuries with that of the Greeks and Romans, must have lost the intensity of its original color, while retaining nonetheless the imprint of its original mold. 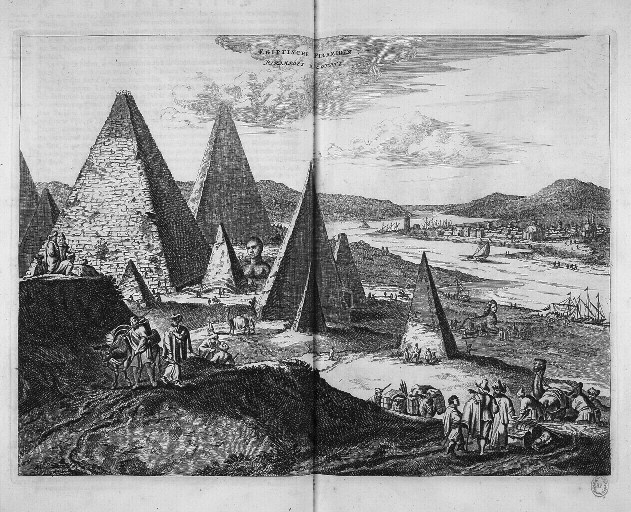 M. Constantine de Volney, Travels through Syria and Egypt in the Years 1783, 1784, and 1785 (London: 1787), p. 80-83. 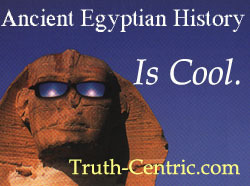 But who damaged the Sphinx's nose & lips? Arabs? Mamelukes? French? British? Germans? Wind, sand & erosion? And when was its face damaged? Both Afrocentrists and Eurocentrists have made bold statements. these two questions is wrong! No one knows for sure. 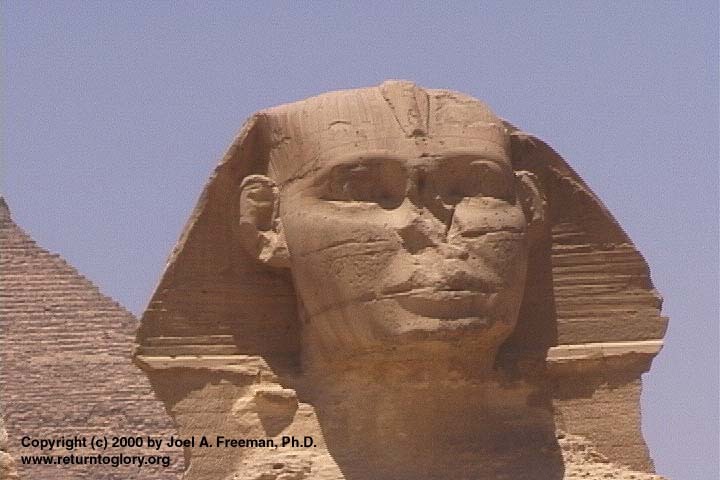 happened to the nose & lips of the Sphinx of Giza, who the perpetrators were, and approximately when the deed had been done. 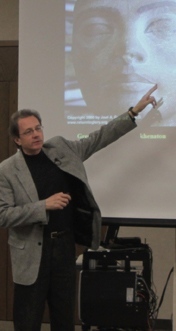 But, when confronted with a chronological overview of historical images I had to admit that I was wrong." 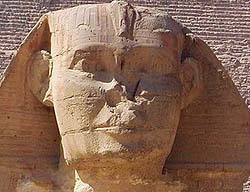 Tuthmosis III ...NOSES & LIPS We all have seen the damage done to the face of the Sphinx of Giza. 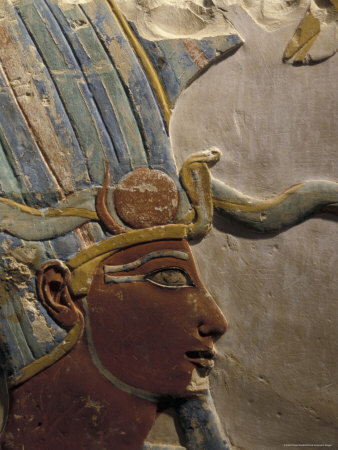 Were some noses and lips on ancient Egyptian statues knocked off because of collective or individual racist intent? Perhaps. But we probably will never know for sure. 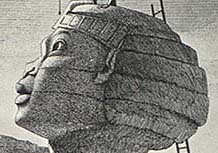 In his book, "The Complete Pyramids," Mark Lehrner states, "Examination of the Sphinx's face shows that long rods or chisels were hammered into the nose, one down from the bridge and one beneath the nostril, then used to pry the nose off towards the south..."
If this is true, then the destruction to the face of the Sphinx was not accomplished with cannonballs fired at the nose and lips. -- Any proof otherwise? and confusion about its nose, lips & gender. 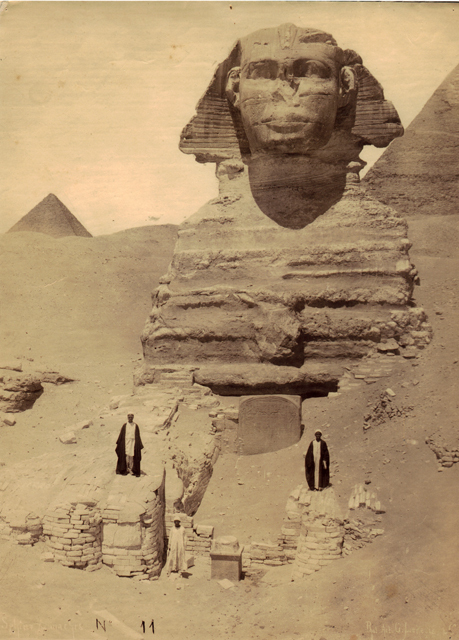 Gaze upon the Sphinx in person or in photographs. 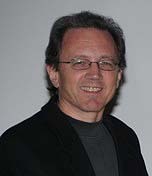 Is its ethnicity obvious to you? Take a look at another intriguing account written by historian Muhammad al-Husayni Taqi al-Din al-Maqrizi (died AD 1442), from a book called al-Mawa`iz wa al-i`tibar fi dhikr al-khitat wa al-athar (G. Wien, ed., 1913). In vol. 2, page 157 of the Wien edition, al-Maqrizi states that the face, specifically the nose and ears, were demolished in 1378 by Sa'im al-dahr -- a Sufi from the khanqah of Sa`id al-Su`ada. The reasoning behind the vandalism, according to al-Maqrizi, was to "remedy some religious errors." At that time some Egyptians were still burning milk-thistle (shuka`a) and safflower (badhaward) at the foot of the Sphinx while murmuring a verse 63 times in hope that their wishes would be fulfilled. 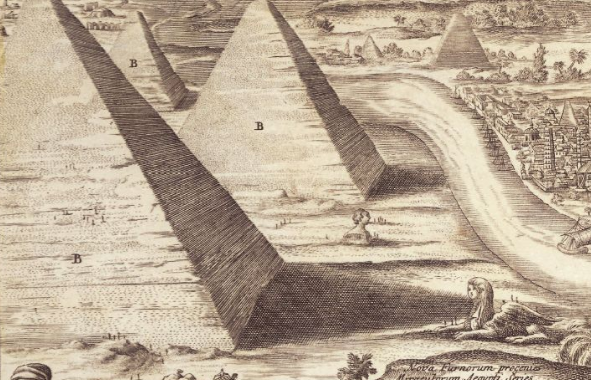 "From the time of this disfigurement also," al-Maqrizi wrote, "the sand has invaded the cultivated land of Giza, and the people attribute this to the disfigurement of Abul-Hol (i.e., the Sphinx)." the ears were also demolished! Take a close look. The Sphinx still has its ears. 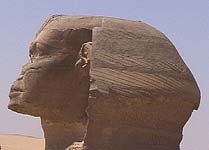 Was the Sphinx disfigured in 1378? The answer is not clear. Not conclusive at all. 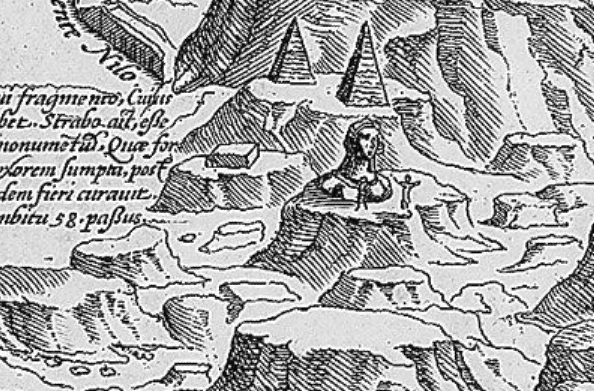 The Great Sphinx of Giza from Hogenberg & Braun's (map), Cairus, quae olim Babylon (1572), exists in various editions, from various authors, with the Sphinx looking different. Is the nose still there? Is it the depiction of a woman or a man? Definite depiction of a woman. No questions asked! Is the nose still intact? 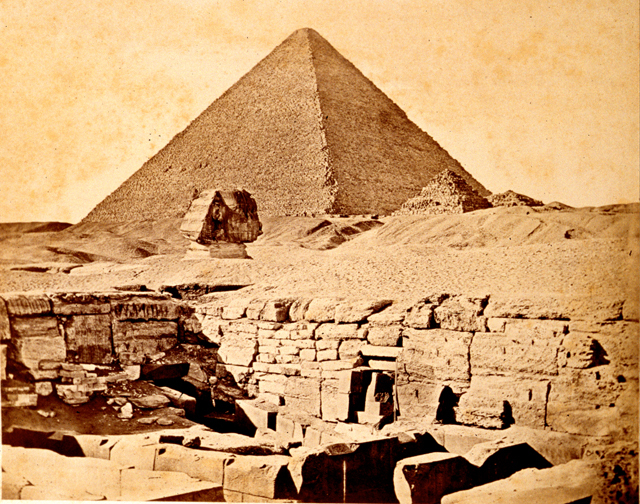 German, Johannes Helfreich, a much-quoted visitor of Giza, tells in his travelogue of a secret passage by which the ancient Egyptian priests could enter the Sphinx and pretend to be its voice. His writings do suggest that he was reasonably familiar with the site. 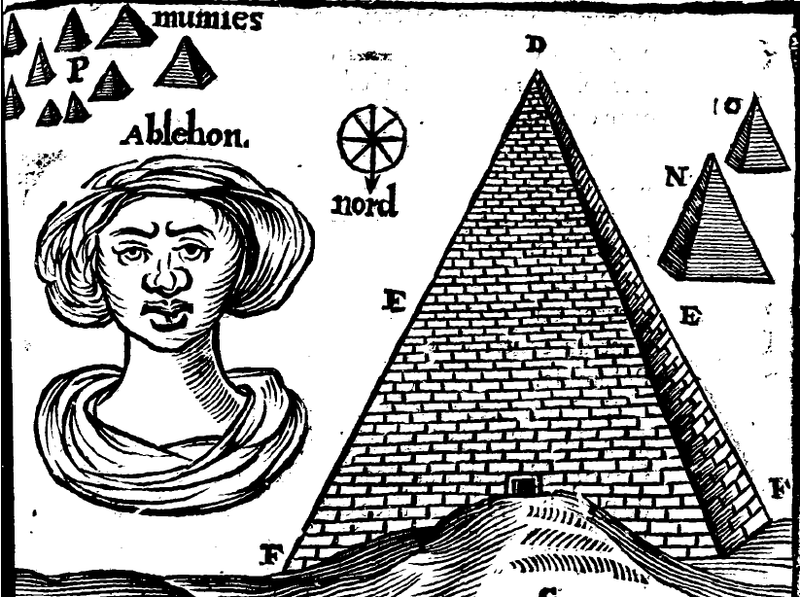 The woodcut he had made for publication in 1579 would suggest the opposite: this Sphinx is blatantly female and about all that has come through of the real situation of the monument at Giza at the time is that the breast is shown buried in the sand and, perhaps, that the hair resembles the damaged head-dress of the Great Sphinx. 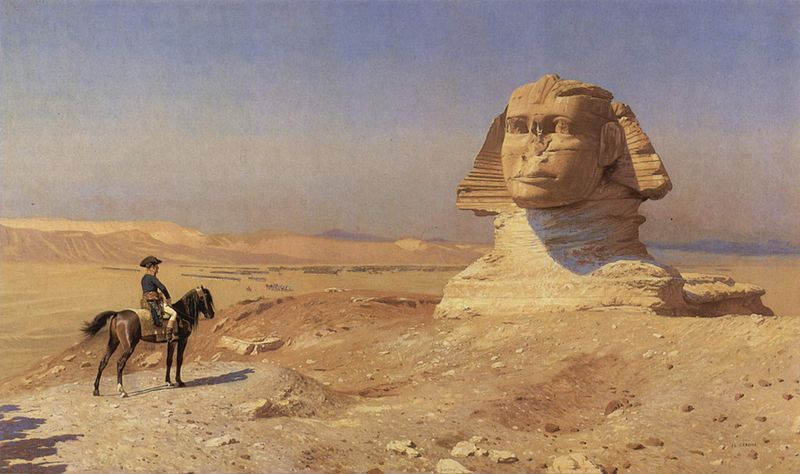 Helferich thought the Sphinx was an image of Isis. Is the nose still there? Is it the depiction of a man or a woman? Giza Plaza (above), with a view of the Sphinx of Giza. The illustrator of George Sandys' Relations of a Journey began in 1610 made a much better job of depicting the Sphinx. Sandy must have made a pretty detailed sketch of it in the field, for the woodcut in his book is really remarkably apt in showing the erosion of the neck, with knobbly protuberances, and the damage to the head-dress, with grooves and notches. 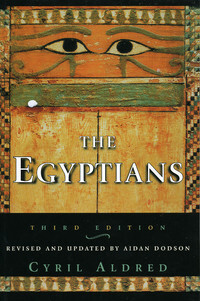 What is more, this illustration of Sandys' book largely avoids the cultural contamination with the classical style that spoils many of the contemporary renditions of Egyptian art. Is the nose still there? Is it a woman or a man? Are the nose and lips still intact? Which images look male or female? Definite depiction of a woman. Agreed? Is the nose still there?
. 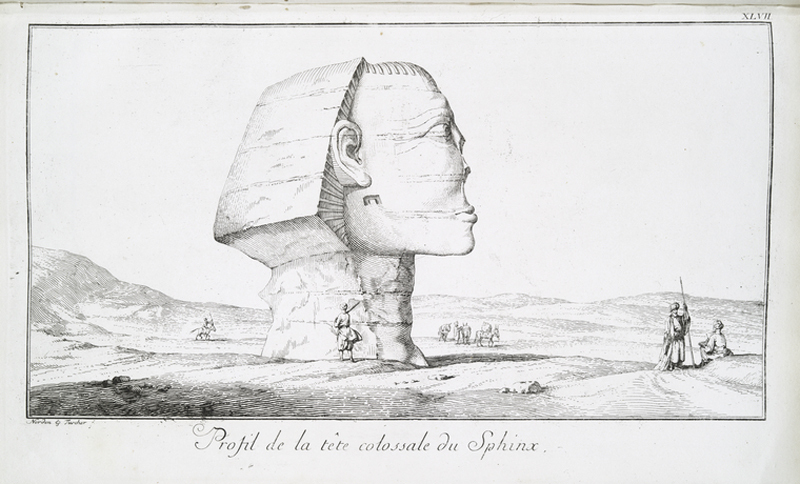 Boullaye-le-Gouz's Sphinx has a rounded hairdo and bulky collar (perhaps the way travelers remembered the protruding and weathered layer of the neck). Balthasar de Monconys interprets the headdress of the Sphinx as a kind of hairnet. 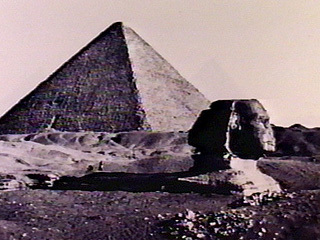 note the two different displays of the Sphinx. 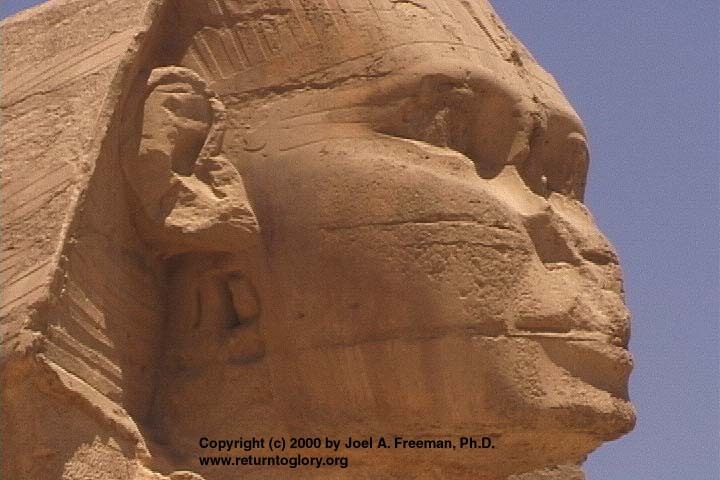 Is the nose still present on the face of the Sphinx? Is the image on the left the depiction of a man or a woman? 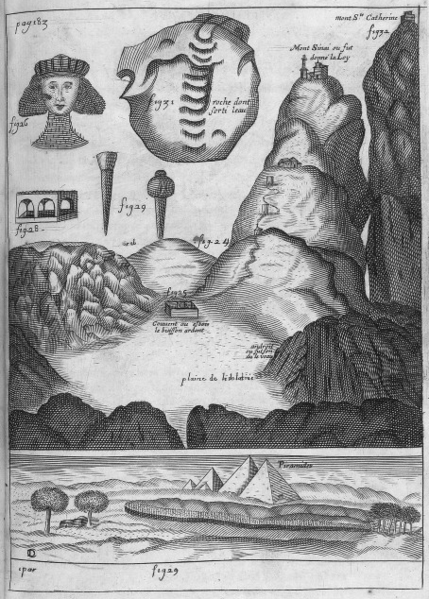 Cornelis de Bruijn's engraving of the Sphinx of Giza in 1698. Are the nose, lips and ears still intact? Pretty clear, huh? Is it the depiction of a man? to learn more about TruthCentrism. Is the nose still there? Are the nose, lips and ears still intact? Is it the depiction of a man or a woman? 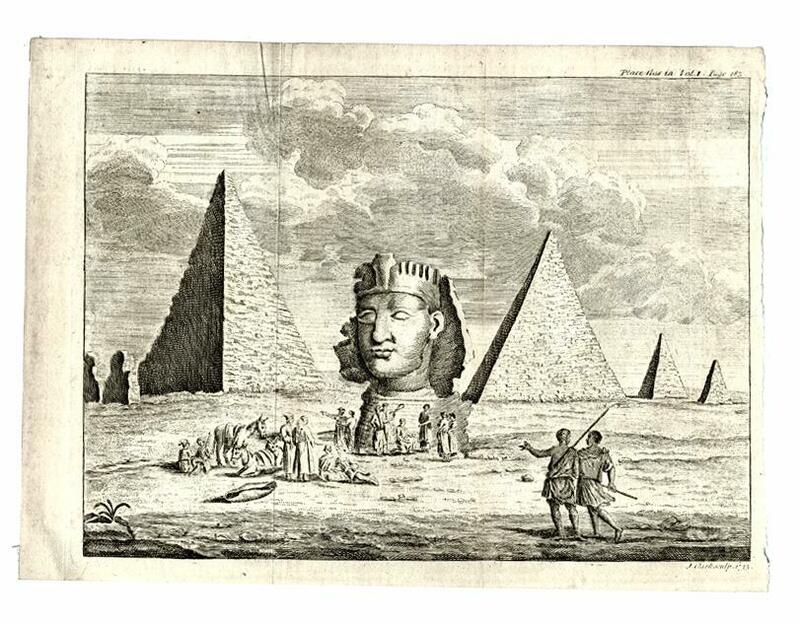 The picture of the Sphinx in Richard Pococke's account of his Egyptian travels, published in 1743, seems to have mimicked Bruijn's work of 1698, even down to the placement of the people standing or sitting near the Sphinx's head.. Erosion and damage are fairly accurately recorded. The nose of the monument is shown intact. Hmmmm... The nose seems to have suddenly disappeared. Is it the depiction of a man? 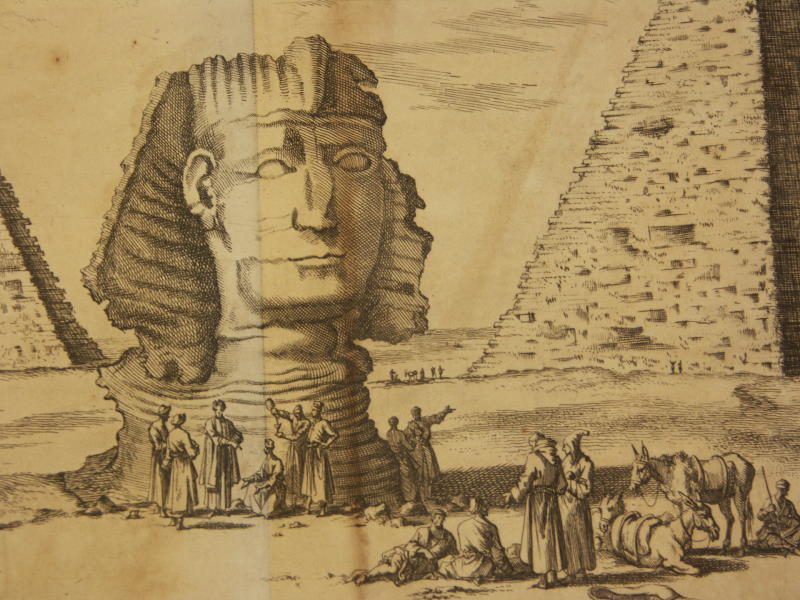 story of his travels in 1755, including two images of the Sphinx. that reveal such a clear loss of the nose? Is it the depiction of a man? This is the only depiction that some will exhibit when trying to prove a particular point. They leave out the other inconvenient images surrounding the date of this engraving. Oops, the nose is back on the face again! What's that all about? I warned you that this was not conclusive. Is it the depiction of a man or a woman? Is the nose still there? Is it the depiction of a man or woman? 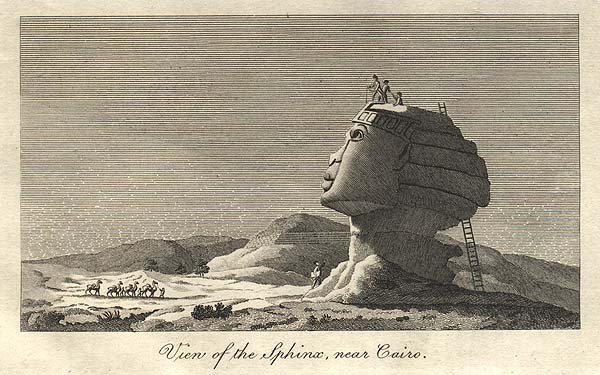 Vivant Denon, who had joined Napoleon's expedition to Egypt as an archaelogist and an artist , published in 1802 his sketches of Egyptian monuments and art objects in his Voyage dans la basse et la haute Egypte (Journey in Lower and Upper Egypt). 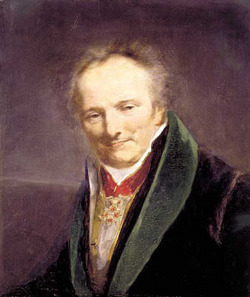 Denon would later become the first director of the Louvre museum. 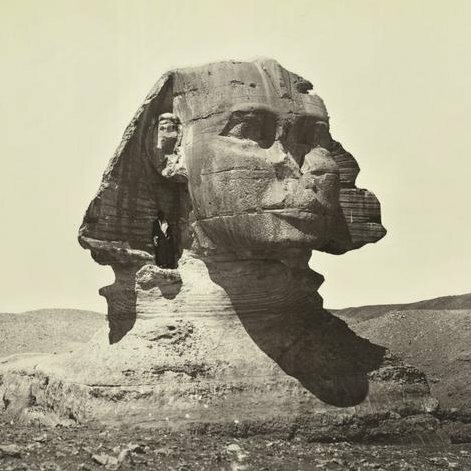 I have read much about the destruction of the face of the Sphinx and still am not entirely convinced that anyone conclusively knows when it happened or who demolished it. 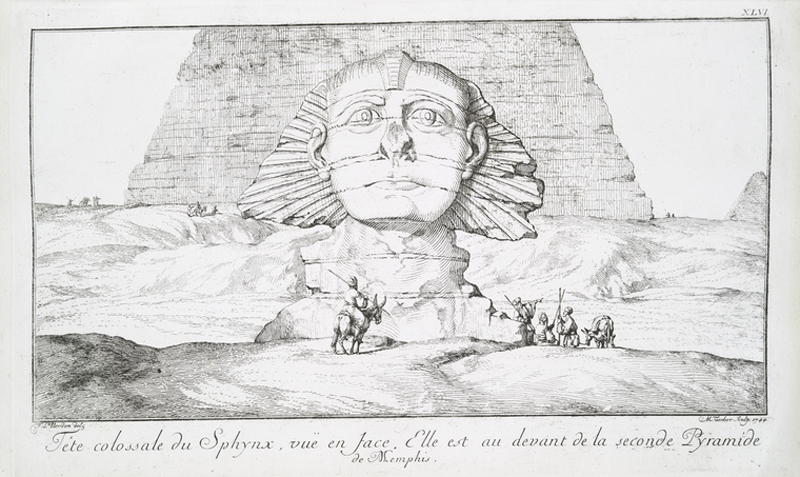 I tend to agree with many scholars that some of the engravings prior to Napoleon's Egyptian military campaign have varying degrees of suspicion surrounding them. But it is also my understanding that some images (shown above with noses and lips intact) were drawn by eyewitnesses...or at least by artists who would have heard some descriptions about the condition of the nose and lips..
One of the main things that continues to give me pause about the conclusive answer to the "who-were-the-perpetrators-and-when-was-it-done" question is what Vivant Denon had to say (and perhaps even more importantly what he didn't say) about the Sphinx, in concert with his etching of the same (see image above). I own an original copy of that etching and Denon's description from Universal Magazine (1803). Denon did nothing but praise the craftsmanship of the Sphinx, describing its lips and mouth as thick, soft, etc. As a confirmed and credible eyewitness, Denon mentions nothing about the lips and nose being demolished or harmed in any way. And his etching seems to reflect his verbal description. 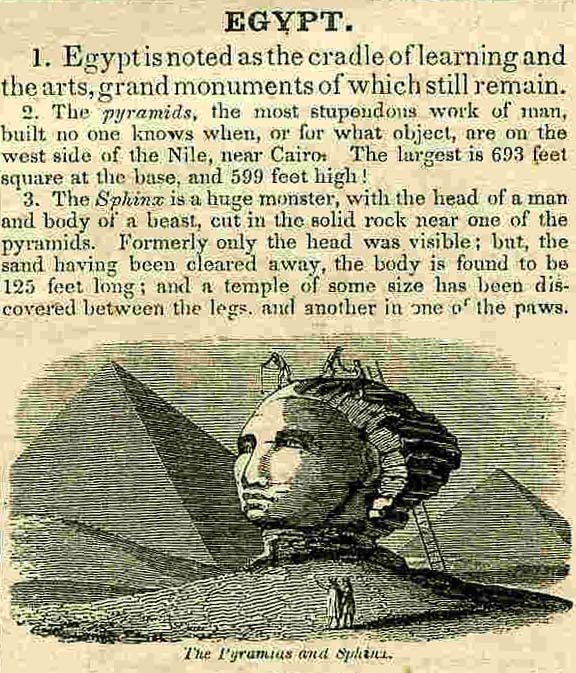 COMMON SENSE ALERT: It seems rational to me that if the mouth and lips had been demolished when Denon saw the Sphinx and drew it, he would have at least mentioned it with a bit of chagrin or regret about the destruction. It was obvious that Denon was smitten by its beauty and I would have thought that he would have at least written about it from the perspective of it's obvious past glory -- something like this. "...the mouth, and lips of must have been thick, with a softness and delicacy of execution that must have been truly admirable; it must have seemed to be real life and flesh. What happened to the nose and lips was shameful. Art must have been at a high pitch when this monument was executed..." Instead Denon writes glowingly about the "thick, soft and delicate" features of the Sphinx in the present tense. This is puzzling to me. Yes, the nose, lips and ears seem to still be intact? Is it the depiction of a man or a woman? THE SPHINX WITH NOSE & LIPS. also published in the Imperial edition of 1822. Yup, the nose is definitely gone -- from this point forward. Is it the depiction of a man? 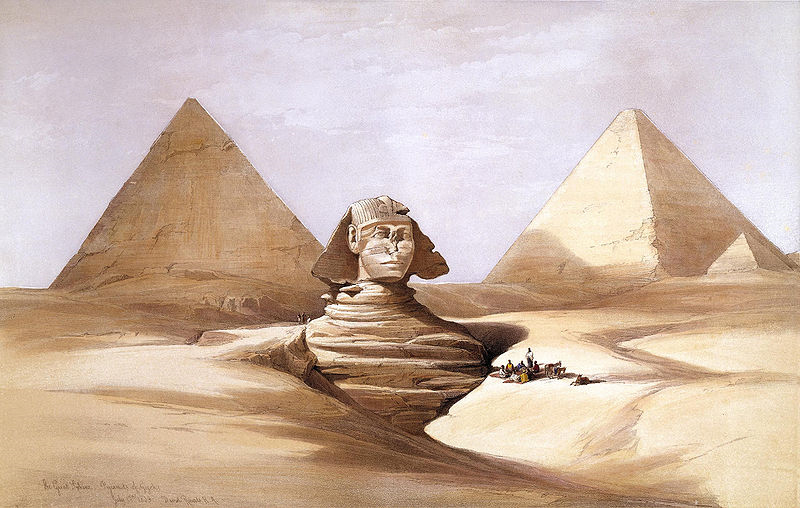 When the Sphinx of Giza was seen by Napoleon's troops, it was largely buried in sand. In 1817 its chest was uncovered by Giovanni Battista Caviglia. 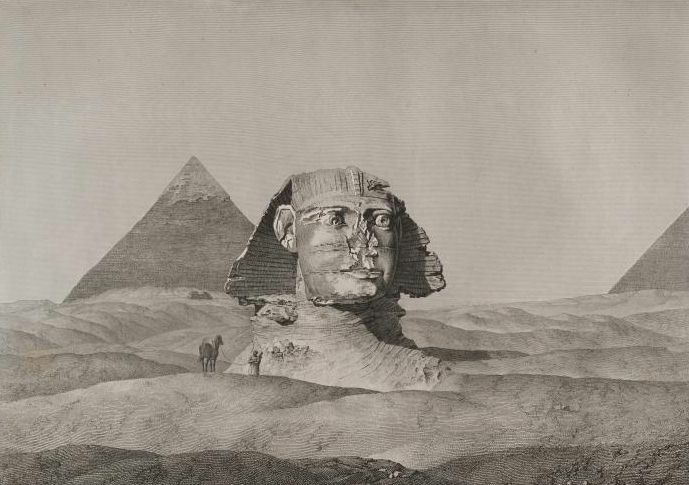 It would take another 119 years before Émile Baraize would excavate the sphinx in 1936 completely. Yes, the nose is definitely gone. See partial excavation. Is it the depiction of a man? From the Photographic Collection of the New York Public Library, 1849. Howard Vyse’s picture of the Sphinx under excavation by Caviglia shows the sand dune around the Sphinx opened up in front of the breast and around the left shoulder, revealing the front paws and the chapel between the forelegs. 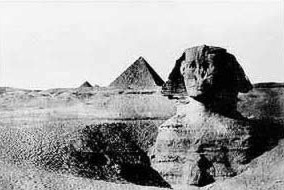 By 1860 the Sphinx had been reclaimed by the desert sand. Conclusive photographic evidence that the nose and lips have been damaged. Is it the depiction of a man or woman? Yes, the nose is definitely gone. Is it the depiction of a man or a woman? Is it the Sphinx depicting a man or a woman? 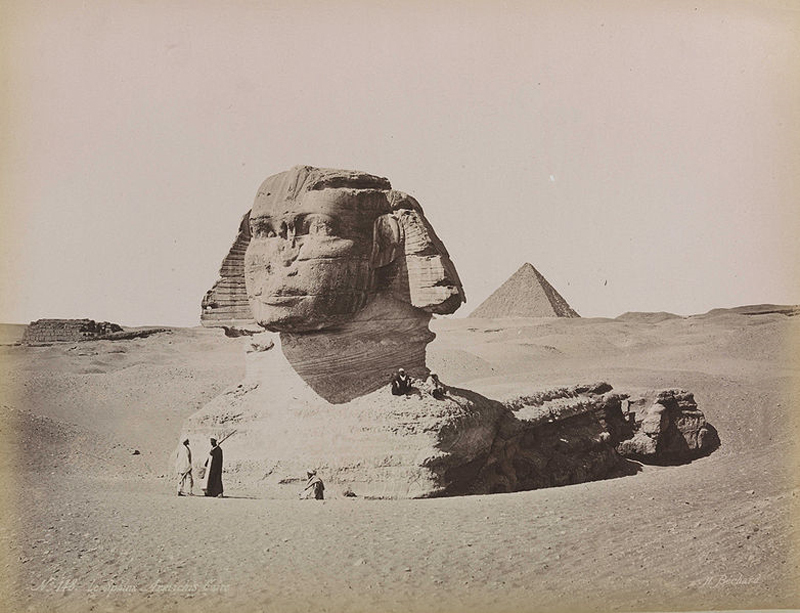 Albumen print of the Great Sphinx by G. Lékègian & Co., circa 1880s. The face is definitely damaged. Is it the depiction of a man or woman? No question. The nose and lips are definitely damaged. Is it the depiction of a man? what we see of The Sphinx of Giza. 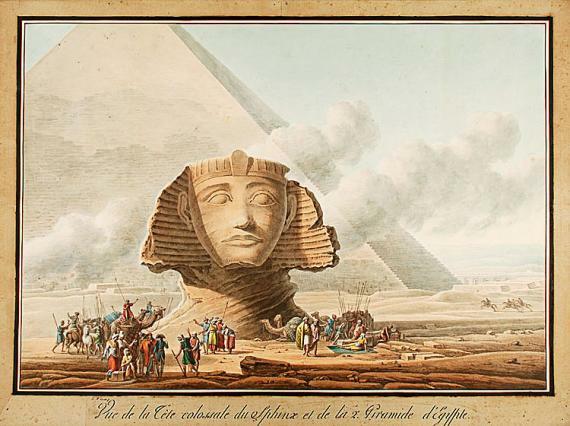 This is what Vivant Denon saw in 1798.
Who damaged the Sphinx's nose & lips? answer to these two questions is wrong! It's fun to conjecture, but no one really knows for sure. It is what it is. Inconclusive. And that's all a part of TruthCentrism. Admitting that no one knows for sure. this page click on image above. "sphinx of giza -- sphynx -- geezah -- pyramids -- pyramide -- nile -- rahotep101 -- phoenician7 -- truthcentric -- afrocentric -- eurocentric -- cairo -- napoleon -- nose -- lips -- french -- english -- turks -- ottom -- empire -- mameluks"